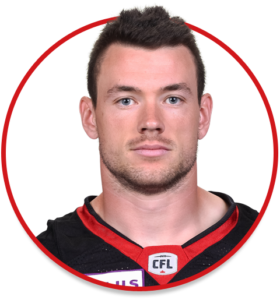 Brendan Gillanders is a Fullback currently playing for the Ottawa REDBLACKS. Signed to two-year contract on Feb. 9, 2016. Re-signed to a two-year contract extension on Dec. 4, 2017. Played in all 18 games of the season. Set a new career-high with 133 rushing yards on 21 carries … Also had 31 receiving yards off of four catches. Standout special teams player across first two seasons with Toronto Argonauts prior to signing with his hometown REDBLACKS … Compiled 14 special teams tackles in 17 games in 2015 … Also rushed once for 11 yards and made seven receptions for 104 yards … Played for the Ottawa Gee-Gees from 2009-13, where his teammates included Ettore Lattanzio and Brad Sinopoli … Overcame a broken leg suffered in the 2010 season opener to return to play in the Yates Cup … Led all CIS running backs with 1,061 all-purpose yards in 2013 and was selected second-team All-Canadian … Played high school football for Sir Wilfrid Laurier Secondary School.